I received products in exchange for this post. Please do your own research before purchasing products or using services. Your opinions and results may differ. Have you ever seen a visually impaired person in public and didn't know how to react, or felt awkward? Have you ever wondered what it's like to 'see' through the eyes of their guide dog? I know I have. September is National Guide Dog Month, so I decided to learn more about what it might be like for people who are blind or visually impaired. 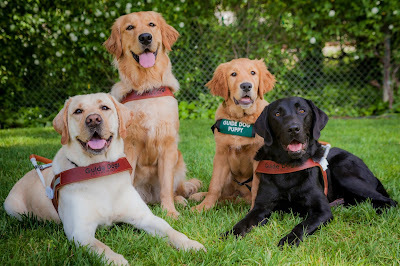 I'm partnering with Natural Balance (the maker of premium-quality pet food) and Guide Dogs for the Blind (a non-profit charitable organization that raises and trains exceptional guide dogs to serve the blind and visually impaired) to recognize the 'Top Human-Canine Teams Who Make Us Believe.' These nine teams are outstanding examples of the amazing partnerships possible between humans and canines. 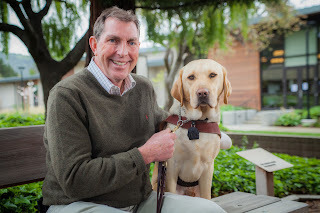 I was particularly inspired by Tom and his guide dog Dynamo, and I want to share their story with you: Imagine you're on the verge of retirement, ready to enjoy your golden years to the fullest, when out of the blue—you lose your eyesight. This is what happened to Tom Kowalski. While Tom was always known for taking on any competitive sport, and was no stranger to overcoming life's adversities, this was a challenge he simply wasn't prepared for. After months of seeing Tom come home from his daily walks with strange bruises, his wife decided to apply to Guide Dogs for the Blind on his behalf. Before he knew it, Tom was headed to San Rafael, California to meet his future soulmate—Dynamo, a professional guide dog. "I've had four great gifts in my life: my wife, my two kids, and Dynamo," says Tom. A superhero guide dog and a superhuman athlete, Dynamo and Tom spent two intensive weeks at Guide Dogs for the Blind training and securing their bond. They have never looked back. With Dynamo never more than 20 feet away, Tom can listen to the birds sing and feel the wind in his hair without worrying about his safety. The added peace of mind that Dynamo gives Tom, and the support and positive reinforcement that Tom gives Dynamo, have helped the two complete a half-marathon together, raising $6,000 for charity. With no signs of slowing down, the two are now planning to hike up Mount Rainier and travel the country—speaking as ambassadors for Guide Dogs for the Blind. As Tom's story shows, in addition to providing enhanced mobility, guide dogs can also be a social bridge, opening a world of possibilities for friendship and human connection. To help people like Tom thrive, please consider donating to Guide Dogs for the Blind. Once there, you can also read about the eight other amazing human-canine teams. There's no better time than National Guide Dog Month to show your support for these incredible people and their four-legged superheroes. Do you have a special bond with your pet? Do you know someone who has a guide dog? Will you consider helping by donating to Guide Dogs for the Blind? yes I never thought I would love a pup but this little rescue is pretty awesome! I am sure Guide Dogs for the Blind has helped many people. What a wonderful organization for sure.